The world premiere for Disney’s Pocahontas was a big deal. Held on June 10, 1995 on the Great Lawn in Central Park, four 80-foot high screens screened the movie to an estimated 100,000 people, making it the biggest premiere in movie history. Here are 15 other things you might not know about the Oscar-winning film. 1. THE IDEA FOR THE MOVIE WAS THOUGHT UP OVER A THANKSGIVING WEEKEND. Co-director Mike Gabriel (who shared directing duties with Eric Goldberg) wanted to do a “western romance,” and at some point the name Pocahontas popped into his brain. Gabriel pitched it to the development team that had been toying with the idea of making an animated Romeo and Juliet for a long time. They were aware of the similar themes and gave it the go-ahead. 2. EVERY SCENE WAS REWRITTEN AT LEAST 35 TIMES. Susannah Grant, Carl Binder, and Philip LaZebnik were the triumvirate of writers that worked off a specific story outline, over and over again, for Pocahontas. Grant would later write Erin Brockovich. 3. IT WAS THE FIRST OF TWO MOVIES THAT CHRISTIAN BALE AND IRENE BEDARD STARRED IN ABOUT POCAHONTAS. Bale played British settler Thomas in the animated feature, then portrayed John Rolfe in Terrence Malick's 2005 live-action film, The New World. Bedard played Pocahontas in 1995, and Pocahontas' mother 10 years later. 4. BALE DID IRISH AND SCOTTISH ACCENTS FOR THOMAS AT FIRST. The directors didn’t know what to do with Thomas in the beginning; they tried both Irish and Scottish accents and tried making Bale sound younger than he actually was. Gradually, he just became Bale’s age (21) with an English accent. 5. BILLY CONNOLLY LANDED BRAVEHEART BECAUSE OF HIS WORK ON POCAHONTAS. After hearing Connolly play Ben in Pocahontas, Mel Gibson hired the comedian to voice King Robert of Scotland in Braveheart. Not everyone in the cast got to meet one another: in the studio, Bedard never met Judy Kuhn, the actress who was the singing voice for Pocahontas, nor did she ever meet Gibson, her co-star. 6. YES, MEL GIBSON REALLY DID SING. Unlike some of the other characters, John Smith did not have one actor to voice the dialogue and another to do the singing; Mel did them both. 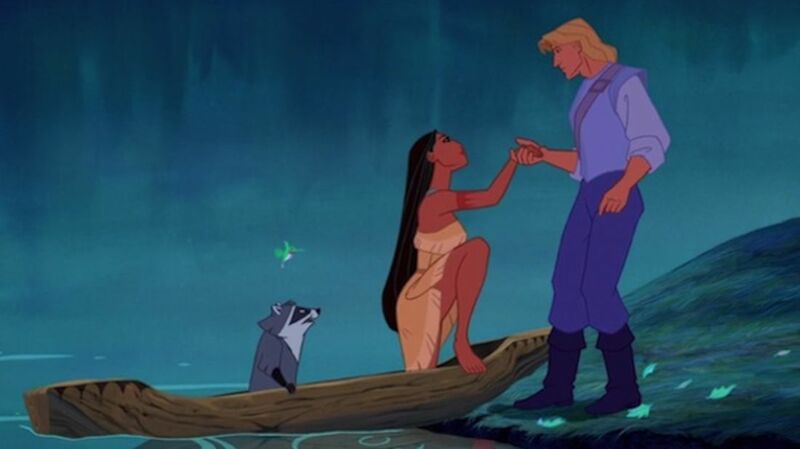 In the straight-to-video sequel, Pocahontas II: Journey to a New World, John Smith was played by Mel’s brother, Donal. 7. "IF I NEVER KNEW YOU" WAS CUT BECAUSE KIDS FOUND IT BORING. Picky children during test screenings didn’t care for the ballad between Pocahontas (Judy Kuhn) and John Smith (Gibson.) The scene was restored when ABC aired the movie in 1997 and for the 10th anniversary DVD. 8. "GRANDMOTHER WILLOW" WAS ORIGINALLY "OLD MAN RIVER." The filmmakers wanted Gregory Peck to play Old Man River, but Peck said no, believing Pocahontas needed a mother figure. 9. JOHN CANDY WAS GOING TO BE THE VOICE OF A TURKEY NAMED REDFEATHER. When Candy passed away in 1994, the animators and writers decided that it was a good time to scrap the idea of Pocahontas having a talking turkey as a sidekick, or having any of the animals talk at all. 10. PERCY THE PUG WAS HISTORICALLY ACCURATE. During their research, Gabriel and Goldberg found that British royalty during the early 17th century carried small pug dogs with them. Gabriel came up with Flit the hummingbird after he couldn’t help but notice all of the hummingbirds that liked to call his backyard home. 11. DISNEY ANIMATORS WERE VERY HIGH ON THE PROJECT. A lot of Disney animators actually tried to get off The Lion King, which was in production at the same time, because they believed it was the lesser of the two projects. 12. THE ANIMATORS FILMED THE ACTORS SO THEY ACTED AS LIVE-ACTION MODELS. In the case of Irene Bedard, the animated Pocahontas looked and moved so much like her that her brother repeatedly nudged her during the Central Park screening whenever her mannerisms were projected on the 80-foot screens. 13. JUDY KUHN STILL DOESN’T KNOW WHAT A "BLUE CORN MOON" IS. It didn’t stop her from singing “Colors of the Wind.” Stephen Schwartz, the movie’s lyricist who wrote Godspell and Pippin, said he based “the blue corn moon” on his research of Native American lore, but the phrase was his own. 14. THE MOVIE WAS RELEASED ON THE 400TH ANNIVERSARY OF POCAHONTAS’ BIRTH. She was born in 1595. The specific day is unknown. 15. IT STRAYED FROM THE TRUE STORY.